I really love this series. These filmmakers know how to let a story unwind. I greatly appreciate the way they allow so much time for their main characters to frolic and glisten in wonder. These animators not only create a visually spectacular cast of dragons and Vikings, but they teach them to fly in ways that are not only believable, but that audiences can feel. See the 3D version � feel like you're flying. Feel like you're falling in love again. "It's just a cartoon" some may say, but this cartoon took my breath away, and then it had me in tears. My only fault with this film is the noisy opening. It takes 10-20 minutes before we feel invited into the film � but once in, audiences will be taken for a beautiful ride in the clouds. Also, I love the elegant way this film wraps the trilogy. Possibly a strong A-, but given the Avatar-like splendor of the Hidden World, I'm going with a full A. 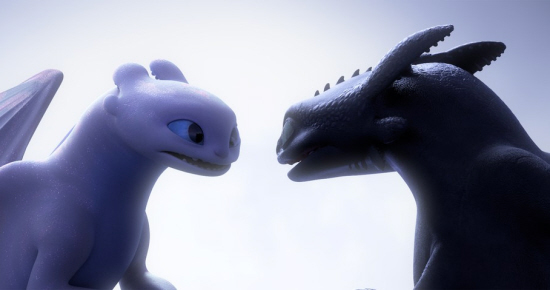 How to Train Your Dragon 3: Hidden World in 3D. Copyright © 2019. Starring Jay Baruchel, America Ferrea, Cate Blanchett, Kit Harington, Craig Ferguson, F. Murray Abraham. Written and Directed by Dean DeBlois. Universal Pictures.